Many of you may not know this but I have a plant and gardening expert on my team! My assistant, Whitney Bouma, was transitioning away from full-time work after she became a mom and I was lucky enough to snag her to be my part-time assistant. Whitney is a botanist by training, the former Director of Education at the Des Moines Botanical Garden and an all-around plant and gardening guru. I asked her recently what homeowners should know about gardening this time of year and she said “one thing new gardeners don’t realize is that if they want tulips and other spring blooming flowers in their yards – they need to plant them the fall before.” I asked Whitney to tell me a bit more so I could pass along the information to you. Some of the most beautiful blooms of the year bloom in the springtime. Tulips, daffodils, hyacinths, crocus, etc. These flowers grow from a structure called a bulb and are planted in the fall, after the temperatures have cooled off a bit but before the ground freezes. Bulbs require a long, cold dormant period (aka winter) before they will bloom. Fall bulbs can be found this time of year at all of the garden centers around town. If you are looking for more unique blooms or varieties – online vendors have an amazing selection! One of my favorite online plant vendors is White Flower Farm – but they tend to sell out fast so it is a good idea to start shopping early! 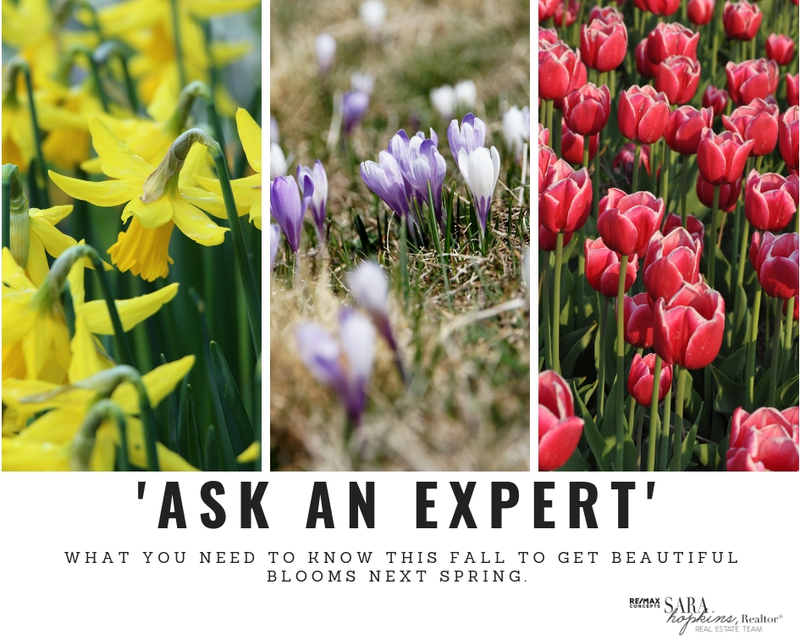 So if you want to plant bulbs this fall, there are a few things to consider. First is location – bulbs prefer areas that drain well. If parts of your yard or garden have standing water after a rain, your bulbs will not be happy. So choose a location where water drains away. Second, bulbs need sunlight so pick a location that gets at least 4-6 hours of sunlight a day. Once you have found your spot, you can start planting. If you have heavy, clay soil – consider amending it with a little compost or humus to loosen your soil. Depending on which type of bulb you are planting, i.e., tulip, daffodil, etc. you will want to plant at different depths. The package you purchased them in should tell you the correct depth but the rule of thumb is to plant bulbs at a depth that is three times the height of the bulb. So if your daffodil is roughly two inches tall, dig your hole six inches deep. After placing the bulb so the tip or peaked part is facing up, loosely cover with soil and water in well. Bulbs look best when blooming if they are clustered together so consider planting five to six bulbs of the same kind together. Just make sure they are spaced several inches apart from one another. And that is the hard part! Now you can sit back, relax and let nature do the rest of the work. If any of you have any other questions that would be good to include in my “Ask an Expert” segment – don’t hesitate to let me know!